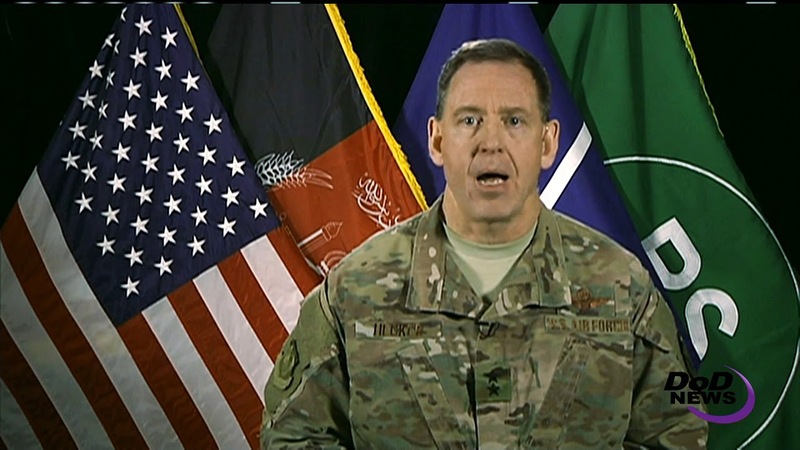 During the past weekend, U.S. forces conducted air operations to strike Taliban and the East Turkestan Islamic Movement, or ETIM, training facilities in Afghanistan’s Badakhshan province, the commander of NATO air operations in Afghanistan said today. Speaking with Pentagon reporters via satellite, Air Force Maj. Gen. James B. Hecker, commander of NATO Air Command Afghanistan, updated Pentagon reporters via satellite from Afghanistan on the alliance’s Resolute Support mission there. ETIM is a terrorist organization that operates in China and the border regions of Afghanistan, Hecker noted. “ETIM enjoys support from the Taliban in the mountains of Badakhshan, so hitting these Taliban training facilities and squeezing the Taliban's support networks degrades ETIM capabilities,” he said. From videos of the airstrikes he showed, Hecker said, it can be seen how a single B-52 bomber demonstrates its reach and lethality by setting a record employment of 24 precision-guided munitions against Taliban narcotics and training facilities. “What allowed this impressive air power to be unleashed was a critical modification that we made to the B-52 in late November, installing a conventional rotary launcher that allows B-52s to carry more precision-guided munitions,” he said. The general provided three examples of air assets now available to the mission in Afghanistan. “We have increased our close air support capabilities significantly by adding an A-10 squadron in Kandahar Air Force Base. We now have 50 percent more MQ-9 intelligence, surveillance and reconnaissance aircraft. And we're adding an additional combat search and rescue squadron,” he said. Hecker added that those are just the tangible air platforms in Afghanistan, and the platforms would have limited value if those were the only changes there. But another change is one you don't physically see, he told reporters. Cripple the Taliban’s revenue-generation enterprise is part of that effort, he said. “We will take away their ability to wage war on the battlefield and brutally murder innocent civilians, like the recent cowardly acts that we witnessed in Kabul and Jalalabad,” the general said.